The Limerock Vintage Weekend has long been a great destination for a motorcycle ride. It is set in bucolic north western Connecticut, and is surrounded by upstate NY and western MA. When the Berkshires and the Catskills are neighbors, you are in great riding country. At the track, a motorcycle parking area on a hill above the swap/paddock area has emerged over time that is always interesting, and the infield camping area often has a smattering of motorcycles. It always delivers a surprise, such as the year when a Vincent was casually parked among the commuter and touring machines on the mound. There was also a Crocker one year inside a vendor tent! 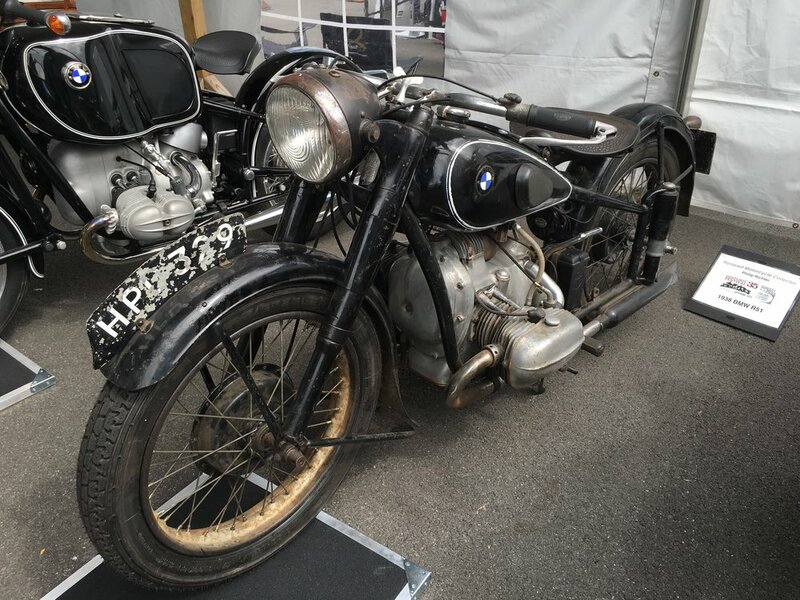 This year, all of that was enhanced by a display of BMW machines from Philip Richter and his Turtle Garage. In addition to a few of Bruce Meyer's hot rods on display, there was an elegant line of BMWs from pre-war to the 1990s. A most welcome surprise to us, and a delight for the crowd of attendees who appreciated vintage machinery in general. It was particularly amusing to listen in on some of the conversations of others admiring the collection. There were comments such as "They all look the same", or "Black must be his favorite color, since he has so many of them".